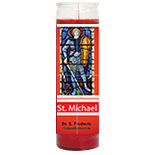 Reviews: Saint Michael Candle - Setting of Lights - $25.00 : ConjureDoctor.com - Home of Dr. E. Hoodoo Products and Magical Services, Get What You Want! Date Added: 02/05/2018 by N. U. Date Added: 10/10/2017 by A. J. Date Added: 10/09/2015 by J. M.
Date Added: 09/18/2015 by J. K.
This is my favorite product.